I got a penguin sweater for Christmas. My daughters and I were shopping at Kohl’s when I first saw it. With a fluffy white tummy and silver sparkly bow tie, I couldn’t think of any prouder honor than to sport this fat penguin on a cold, snowy day. My teenage daughter, fashion consultant, cautioned against it. “But, it’s SO CUTE!” I countered. The older daughter, having lived through more of these episodes than her younger sibling, and having let go of the hope of transforming me into a fashion forward maven, said they would alert my husband. I left the sweater hanging on the rack, secretly hoping we would meet again. 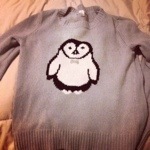 I’ve come to realize, that such a powerful fashion accessory as the coveted penguin sweater takes careful moderating. We’ve had, like most of the country, a particularly snowy, blustery winter. I could have easily worn my penguin sweater every day. Conscious of the cautioning of my daughters, I’ve had to choose selectively when to go all penguin. It’s been a struggle. It’s now near the end of February and old man winter is not letting up. I’ve read the depressed Facebook posts of friends regarding winter, the braggarts’ posts of basking in the Florida sun, but I’m not saying a word. Sure winter has it’s downside, but when else can you wear your favorite penguin sweater? So bring on the snow! Blow all the arctic air my way! Slushy streets, salt trucks, and icy patches? No problem. I’m rocking my penguin sweater!